Looking for new butternut squash recipes? 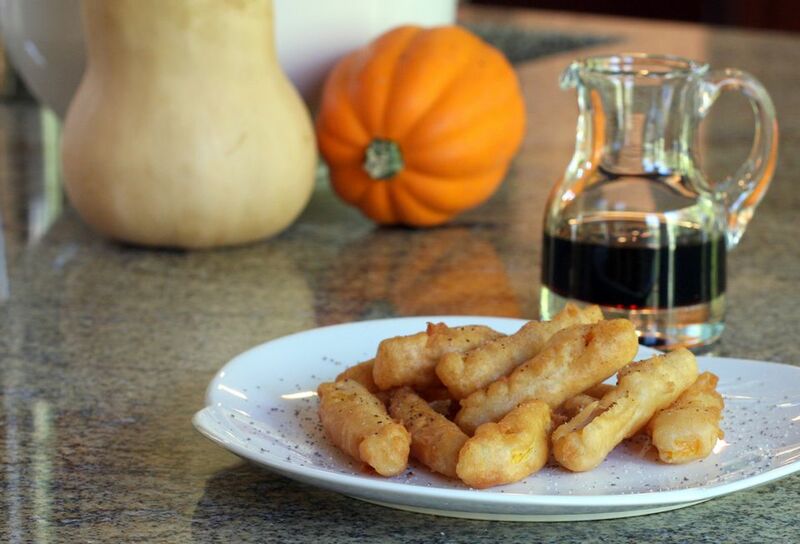 This warm and comforting fall snack tastes great with maple syrup or a savory dip. Combine 1 cup of flour, the cornstarch, baking powder, salt, cinnamon, allspice, and sugar. Whisk together the egg and milk and whisk into the dry ingredients until smooth and well blended. Cover and refrigerate for at least 1/2 hour. Put the remaining 1/2 cup of flour in a food storage bag. Heat oil in a deep fryer or deep frying pan to 365 F.
Peel butternut squash with a Y peeler or vegetable peeler, cut in half, and remove seeds with a spoon, scraping the softer membranes out of the cavity. Cut the squash into 1/2-inch by 2-inch sticks (approximately). Toss the squash sticks with the 1/2 cup of flour in the food storage bag. Dip in the batter and let excess drip off. Fry in small batches for about 3 to 4 minutes, or until golden brown and tender. Drain on paper towels. Serve with maple syrup or your favorite dip or fruity salsa.